The Husky is without a doubt, a wonderful breed and can be an excellent addition to the family. However, like all dog breeds, Huskies also have a challenging set of issues that are specific to the breed. Prospective owners should be aware of these issues before looking to purchase or adopt a Husky. Owners who are not new to the world of Huskies will immediately recognize the following common behavioural issues within this breed. Digging is one of the most common Husky issues. It is known as “denning” behaviour and it is what dogs do in the wild – they dig holes to have their pups or simply to find a dark, closed space where they can feel safe in. No matter the reason for your Husky’s digging behaviour, you will be much more successful in fixing the issue if you provide a designated digging area for him rather than attempting to stop the digging. The best way to teach your Husky where he can dig is to praise him each time he digs in his spot. Huskies are notorious for being escape artists. They can be quite mischievous and clever when it comes to searching for ways out of your yard. Their desire to explore and roam will cause them to do whatever it takes to get out of that yard, whether it means going under, over or through fences. It can be helpful to have the type of fence that goes deep into the ground, in case your Husky tries to dig under it. Huskies should be supervised whenever they are out in the yard even if you have a fence. It is not unheard of for a Husky to jump over a 6 foot fence. Unfortunately, it is very difficult to train a Husky to stay at home. However, some Husky owners have found success in placing electrified wire on the top and/or bottom of their fences, depending on whether their Huskies like to jump over or dig under the fence. When used and installed properly, this method is not cruel at all. You can find low power electric chargers at home improvement stores for electrifying the wires. The wires produce a small and harmless static shock which Huskies hate the feeling of. This method is quite effective against escapes as Huskies will quickly learn to avoid those parts of the fence. Another common Husky issue is howling. Huskies usually howl when they have excessive energy or when they are seeking companionship. Providing your Husky with sufficient exercise can help to curb this problem. This breed was bred to run for miles and miles everyday and as a result, requires a great deal of exercise on a daily basis. 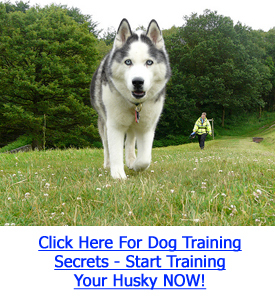 Merely walking your Husky is not enough – try taking him jogging or at least, for a brisk walk. You may also wish to try crate training your Husky. At first he may howl in his crate. Simply ignore the howling and he will eventually stop. Never allow him out of his crate when you know he is only howling for attention. Your Husky will eventually take to his crate and stop howling when he is inside.